In Plecto you cannot delete users but only deactivate them. This is primarily done not to lose their data. Deactivated users cannot log into Plecto, and won't be visible in manual registration boxes. Go to 'Organization' > 'Employees'. Click on a user and click 'Edit' in the upper right. Click 'Manage this employee manually'. 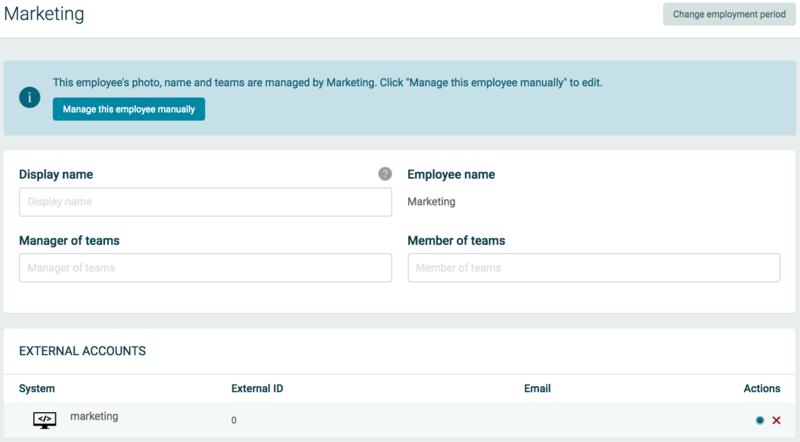 Remove teams (the user will be removed from dashboards that use teams). Click on the red 'Deactivate' button. If your page looks like the picture above, the user can't login to Plecto because this user was imported directly from an external system. In this case Google Analytics. This user is not managed by an external system. It was either created manually in Plecto and/or invited to Plecto with login access. On each employee's profile in Plecto you can change their employment period. After the employment period has ended this employee will lose access to Plecto and their personal data will be pseudonymized. Select 'Employment start date' and 'Employment end date'. When the employment period ends the employee will be psedonymized 'Former Employee 000000'. The employee will no longer show on the employee list and it is not possible to look up the psedonym. But you can always find the employee if you check 'Show deactivated employees' and search for the name.